Is inefficient strategic planning killing your company's bottom line? Did you know that a recent study of corporate failures showed that 80% of the companies’ lost value was due to poor strategy? That results in corporate downsizing, depressed salaries, and no bonuses. 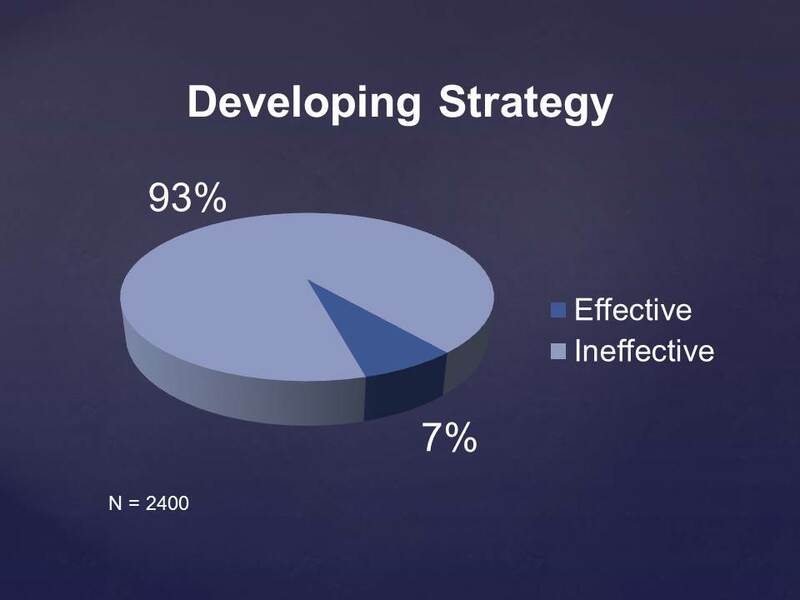 To compound the problem not very many companies are good at forming strategy: according to PriceWaterhouseCoopers, only 7% of companies are excellent at strategy development. The Lean Strategic Decision Model, or LSDM for short, is an easy to learn tool that helps businesses develop pragmatic and actionable strategic plans in less time. This process helps companies systematically evaluate its available options and efficiently select the best growth strategy. We have developed an on-line training course that teaches the LSDM process. Once you've learned it, you will be able to implement LSDM in your company. This will help your company make better strategic decisions, and do it more quickly. There are 4 main sessions in this course. Each session starts with an introduction, then you move into a 40 - 50 minute training video. The video is followed by a FAQ section. In many sessions this is followed by a section containing downloads of important tools that you can use to implement LSDM in your company. Each session closes with a homework assignment that helps you start to manage a strategic issue your company is facing. LSDM is not a theoretical model that suggests a useless generic strategy. It is a step by step approach that guides the team in forming and selecting a business strategy that addresses the company’s unique strategic challenge. LSDM breaks complex business strategy problems into easier to analyze components. As a result executives attack these business challenges more quickly and develop winning strategies more easily. Steve Garchow is the President at Foresight Business Consulting, a Chicago-based strategy and marketing firm. He also is a professional business speaker. Steve is obsessed with making a difference in the way companies form strategic decisions. He believes any company can significantly improve performance by implementing a defined strategic decision process, including his own proprietary process, the Lean Strategic Decision Model. Steve started as a market researcher, eventually building his career by assuming greater marketing and general management responsibility. As VP, Global Marketing for a Fortune 300 company. Steve became intimately involved in strategy formation. Then, as the leader of a multidisciplinary task force established to select the next generation portfolio for one of the company’s half a billion dollar franchises, Steve recognized the need to develop a new decision approach. He developed a process to overcome the team’s problems of incomplete issue framing, inadequate decision criteria identification, endless data collection and detrimental group dynamics. Using this structured approach, his team successfully forged the new franchise. After stints as a senior manager of two start-ups, Steve launched his consulting company. In many of his consulting engagements he was surprised that companies had such a difficult time forming successful business strategies. Many executives cited a lack of time as their major impediment. This stimulated Steve to ask, “How can I help executives formulate strategy in the compressed time frame demanded by their position?” He realized senior executives needed an approach that allowed them to fit strategy decisions around the operational decisions that consumed their day. That is the purpose of the Lean Strategic Decision Model (LSDM). This methodology provides a simple approach for driving effective strategic decisions using an efficient process. Steve is the author of two books, the most recent achieving international best seller status. Titled “Stratification: How strategic decision processes will create sustainable competitive advantage,” the book explains the barriers to strategic decision-making and techniques that mitigate them. Since developing LSDM, he has presented the model in seminars, successfully implemented LSDM for clients and counts many companies as experienced LSDM advocates. Steve has discussed his strategy views on numerous radio and television broadcasts. Steve earned his B.S. in medical technology from Michigan State University and has a M.H.A. in hospital management from the Ohio State University. He and his wife, Maree, have three grown children.